The second Edenraid challenge enabled the Group to make an even bigger donation than last year to the Make-A-Wish charity, which makes the wishes of seriously ill children come true. From September 10 to November 4, 2018, Edenred organized its second Edenraid event that challenged its employees all over the world to run, walk, pedal or swim for a good cause. Thanks to the efforts made by 2,353 participants in 41 countries, a total of 327,478 km were covered by Edenred's employees, almost 10% more than in 2017. After converting this performance into euros, adding the personal donations made by employees and including the supplements paid by Edenred, this year, the Group was able to make a total donation of more than €40,000 to the Make-A-Wish charity. This donation, which is higher than the amount given last year, will make the wishes of five sick children come true. 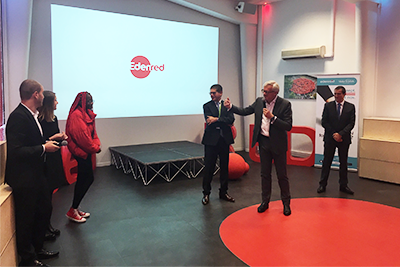 The Group’s donation was handed over on November 14 by Bertrand Dumazy, Chairman and Chief Executive Officer of Edenred, to Alain Del Puerto, Chairman of Make-A-Wish France, at a ceremony at the Group's head office. The many employees who attended the ceremony could listen to the story of Jennifer, a young girl who was able to make her dream of becoming a YouTuber come true, thanks to the charity’s support. For more than 30 years worldwide, and more than 10 years in France, Make-A-Wish has been making the wishes of seriously ill children come true. Edenred, which shares Make-A-Wish’s values of respect and imagination, is proud to support this charity, whose efforts significantly improve the well-being of thousands of children and their families every year.